Many factors contribute to the loss of skin elasticity in the breasts. During pregnancy and breastfeeding, breasts often fluctuate in size. The areolas can become enlarged. Genetic factors, weight fluctuations, and gravity can also affect breast shape over time, leaving them prolonged and flat. Breast uplift procedures are common and growing in popularity. Breast uplifts will rejuvenate a woman’s figure and supply them with a younger, perkier chest. At The Hamlet Clinic, Dr. Grant Hamlet provides personalized treatment to achieve his patients’ aesthetic goals. Safety is of the utmost importance to him and his expert staff. Patients will be treated with attentiveness and care. 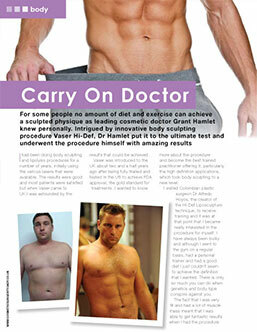 Dr. Hamlet is renowned for his skill, as well as the expertise of his highly trained team. He specializes in beautiful, natural, and safe body sculpting. A breast uplift, or mastopexy, is an surgical procedure that involves removing excess, stretched skin and breast tissue. The skin is then tightened to raise and reshape the breasts to their placement of younger years. Breast uplifts will also reduce enlarged areolas by reducing the tissue. These procedures are commonly combined with other breast rejuvenating treatments to create beautiful results. This procedure is commonly performed on women in their 30s to 50s, but all patients are welcome to discuss the benefits of a breast uplift. 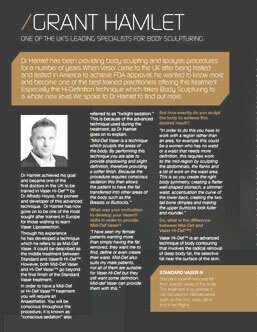 If you are interested in how a breast uplift will impact your life, contact Dr. Hamlet today! During your personal consultation with Dr. Hamlet, you will get to discuss your concerns, cosmetic goals and expected outcomes of a breast uplift. Dr. Hamlet will listen to you and develop an individually tailored plan that best achieves your goals. During this consultation, Dr. Hamlet will inquire about the patient’s general health, past procedures, and current medications. He will then perform a physical exam, taking photos and measurements of the breasts. This will allow him to examine the patient’s unique anatomy and develop a personalized treatment plan. Patients are encouraged to ask any questions and voice their concerns and feelings about the procedure. Dr. Hamlet and his staff focus on building relationships with their patients to ensure their comfort and confidence in their cosmetic decisions. Prior to the procedure, the patient will need to adjust medications and stop taking blood-thinning pills like aspirin. Smoking will also need to stop about two weeks before the procedure. Dr. Hamlet will prescribe antibiotics to be taken before the procedure. The procedure will take two to three hours, and you may go home on the same day. However, you will need to coordinate with a friend or family member to pick you up and drive you home. Patients are encouraged to wear loose-fitting clothes that won’t apply unnecessary pressure to the treated areas. Clothes that zip or button are preferable. Through his many years of expertise, Dr. Hamlet has developed remarkable attention to detail that helps provide beautiful results for his patients. Techniques used to remove breast skin and reshape breast tissue will vary based on a patient’s anatomy. The specific technique Dr. Hamlet uses will determine the location of the incisions. Incisions may be made around the areola, downward from the areola to the breast creases and horizontally along the breast creases. When the patient arrives for their breast uplift, the surgical team will prep and mark the areas to be treated. General anesthesia will be administered to minimize any discomfort. Dr. Hamlet will gently make incisions along the predetermined areas. The tissue will be molded and reshaped to create the optimal outcome. Extra skin and tissue will be trimmed and sewn back together with sutures. Dr. Hamlet may place stitches within the breasts to reshape the tissue and, if necessary, to reduce the size of the areolae. 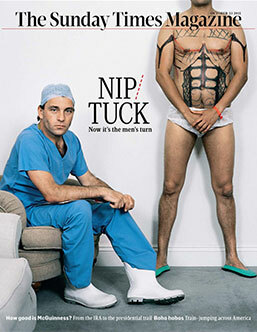 He may also use a combination of sutures and surgical tape to help the skin adjust to the new contours of the chest. A breast uplift procedure will have a major rejuvenating impact on a patient’s appearance. If you are interested in how a breast impact could transform both your figure and your self-confidence, contact Dr. Hamlet today! Coming out of surgery, the breasts and incisions will be covered in bandages and a large compression garment. This compression garment will act as a support bra and will need to be worn for a few days after the procedure, after which a soft support bra will be worn for three to four weeks. Patients are commonly allowed to wear underwire bras after eight weeks. The initial compression bandage and support bras will help the breasts settle into their new positions as swelling diminishes. Patients will need to avoid straining, bending and lifting. They will also need to sleep on their back or side to keep pressure off their breasts. Sexual activity will need to be avoided for at least one to two weeks after the breast uplift. At follow-up appointments, Dr. Hamlet will assess the patient’s health, remove drainage tubes and incisions and replace bandages. Not all stitches need to be removed as they may be dissolvable. Incision lines fade significantly over time. Patients often return to work after the first week of recovery and resume normal activities around this time as well. Exercise will need to be limited to walking for the first few weeks after the surgery. Dr. Hamlet will monitor the patient’s recovery and notify them when it is best to resume activities such as regular workouts and washing hair. Dr. Hamlet is a qualified plastic surgeon who will be monitoring your recovery closely with follow-up appointments. Following Dr. Hamlet’s care instructions will help produce your best outcome. Results will be immediately visible and become more apparent as swelling diminishes. The shape of the breasts will continue to change and settle over the next few months. 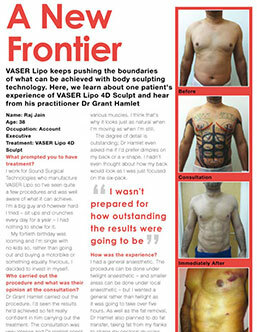 Incisions lines will fade with time, creating a naturally beautiful chest. The best way for a patient to retain their new look is by maintaining their weight and a healthy lifestyle. By following Dr. Hamlet’s detailed care instructions, the best results will be yielded. While a breast lift will improve the shape and position of the breast, it will not increase breast size or restore lost breast volume A common procedure patients get alongside their breast uplift is a breast augmentation. There are two categories of breast augmentation; implant and fat transplant. These procedures enhance the volume and shape of the breast. There are two implant types to choose from, saline or silicone. A saline implant is a bag that is inserted under the breast muscles to create a mound. The size of the implant is adjusted using a saline solution. This solution may be adjusted during the procedure and in follow-up appointments to maintain the size the patient desires. 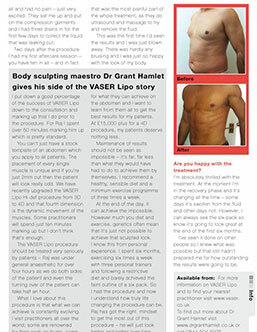 Saline implants are a popular implant because they are filled with a natural solution the body can absorb. A silicone implant is filled with a gel substance. Silicone is a highly popular implant choice because it feels the most like natural breast tissue. Patients who receive silicone implants will return periodically to Dr. Hamlet office to receive check-ups on the health of their implants. The other breast augmentation option is a breast fat transfer. Breast fat transfers take place in at least two procedures. The first step is for fat to be removed from donor areas in the body like the buttocks or thighs. The fat is then purified and placed in injectable needles. In a separate procedure, discreet incisions are made along the breasts to inject the fat into. This procedure provides the most natural feeling results that are permanent. Both silicone and saline implants have shown to last an average of ten years in the breast. The results of a breast fat transfer usually last for the rest of the patient’s life! Breast augmentations are commonly paired with breast uplifts and can enhance the results greatly. Don’t hesitate to ask Dr. Hamlet about pairing these two procedures together to provide the best solution to your goals. The price of a patient’s breast uplift procedure will vary based on their desired outcome and unique anatomy. If you are interested in how a breast uplift will positively impact your life, contact Dr. Hamlet today at (0207) 127-4377.